Yeah...very good choice ! I will do the same...a dotcom portable 22 or something so, for beginin'. It's allways possible to expand it later. I sold said dot com to buy the ARP 2600. Not a move that everyone would necessarily understand or appreciate, but it was the best for me. I don't regret it even a tiny bit. xpander wrote: i'm just going to watch this space for RobotHeroes to chime in with some hate about the length of this novel. I guess I am late for the party. Another of AG's excerpts from his "Lord of the Synths" trilogy? I think that part was out of "Fellowship of the Filter". No hate for AG ever though since he is cool. But on a serious note AG is awesome and writes all his posts by hand with pen and ink to proofread before typing and publishing to the board. You have to admire such dedication. I actually read that whole post. It took 6 days to read all that, which is why I am so late, but I did it and I just got a certificate of completion and a free ipod. hail to the king baby. RobotHeroes wrote: But on a serious note AG is awesome and writes all his posts by hand with pen and ink to proofread before typing and publishing to the board. You have to admire such dedication. I actually read that whole post. It took 6 days to read all that, which is why I am so late, but I did it and I just got a certificate of completion and a free ipod. I have hurt myself laughing. At myself. Well, I would hope that a certain neutrality came through in the functional comparison. Admittedly, I favor the CS-15 over the MS-20, and that favor is pretty obvious. I promise you, though, that that favor isn't born of some arbitrary perspective, but rather simply that one seems more powerful and useable in so many ways. The bias comes in regarding functionality which I don't often use, like the ESP. Although I did state that it was an incredible feature without match! Everyone knows I focus on analog performance synthesizers more than I do processing devices, MIDI-capable things, etc. So, there is definitely that bias in there, too. He should get out the chain gun and aim it at the MS. Even Duke Nukem has nightmares about the MS-20 patch panel. Even Duke. Full modular isn't the same as a semi-modular, I've realized that as I started building my own Analogue Systems. I mean, mine has now the same abilities as an ARP2600 (or minimoog for that instance). Same number of modules and same types (plus some more naturally). But still, the amount of patching that is required to make a simple 3VCO sound with some modulation is baffling, compared to just pushing the pots into the VCF and pushing a couple more pots to add the modulations. You first have to give the 3 VCO's a pitch CV. In my case an Octave Controller, 1 cable. From OC to each VCO's pitch input, 3 more cables. Saw output on each VCO to mixer inputs. 3 cables. Mixer out to filter input, 1 cable. Filter lowpass out to VCA in, 1 cable. Now that's 9 cables just for that most basic sound. The you add in EG's, with a cable from EG out to the module you want controlled (like the filter cutoff), and to avoid clicks you should activate the VCA with an EG aswell. Now we're up to 11 cables. LFO modulation, whopps one more cable. And so on. I'd think that I'd spend all day replicating Minimoog sounds once I got my modular up to 3 VCO's, 2EG's and a LP-filter. But really I don't. The mini is the mini because it is so super easy to use, and super fast to learn. A modular is something you spend weeks and months getting your head around. Mine has been switched off for weeks at a time too. I simply didn't wanna bother with all the cables for a while. Many of those sickest modular effect sounds are created by sheer accident (or frustration, just turning some knobs at random). Same with the weirdest sounds from an ARP 2600. And Alesis Andromeda. 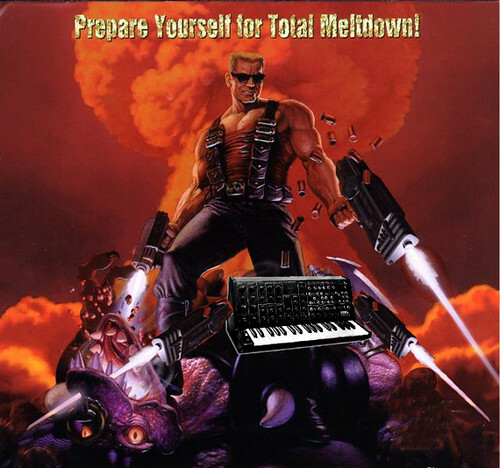 I created the sickest modulation madness effect once when I left the synth on while cleaning around the knobs. And whoopee, psycho sounds as everything was randomized. so a cs15 is next on my list after reading this post. Gear: Pro 2, MiniBrute, MicroBrute, Prophet 12, El Capistan, blueSky, Deco, Abelton Live, DX7, RX15, TR-8, Metasonix F-1, MF Drive. How are the envelopes on the CS-15? I've heard the CS-10's are better, but I want to know if they are snappy enough for ya AG? I'm personally convinced the whole "slow envelopes" myth is derived from people not noticing the "x5" switch on the envs. They go all the way down to a high-pitch click - not too sure what you'd want them any faster for. piRoN wrote: I'm personally convinced the whole "slow envelopes" myth is derived from people not noticing the "x5" switch on the envs. They go all the way down to a high-pitch click - not too sure what you'd want them any faster for. xpander wrote: speaking of which, you can look forward to my Old School Minimoog vs Minimoog Old School youtube pretty soon, it will be bee's knees. Too late it's already been covered in last month's Keyboard magazine's review of the old school, oh wait the conclusion was there wasn't any sonic difference between OS and Voyager but the Model D still won, but it would still be fun to see your YouTube comparison..btw do Bee's really have knees? Btw AG I have to admit I prefer your synthesizer analysis in YouTube format much more, my ADD allows me only two long paragraphs before I have to bail. filtermod wrote: I guess you'll just have to deal with it. bah, it's just another versus thread. If you found the comparison (which I'm sure you didn't read) in error or lacking content, feel free to address the issue. Otherwise, see if you can keep from proving that mockery is the simplest and least impressive form of humor. I like you AG. Your post was long but very objective and informative! I just bought one of the synths compared. Guess which? I wondered what happened to this thread. Now I've cluttered another thread with my giant textification. Gear: K2500, Vsynth, Karp, Prophecy, Volcas, Monotribes, Oasys PCI, Oberheim Matrix, SEMs, Nord Drums, Microbrute, Yamaha EX5R, + multiple Euro modulars.